J. M. W. Turner | John Cother Webb mezzotint "Regulus leaving Carthage"
Medium: mezzotint. 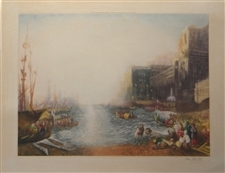 Executed by John Cother Webb after the J. M. W. Turner painting and signed in pencil by John Cother Webb. Printed on chine-collé paper (china paper mounted by the publisher onto a heavy wove paper support sheet) and published in London in 1924 by The Museum Galleries; with the publisher's blindstamp in the margin. Image size: 13 1/4 x 17 3/4 inches. Plate size: 16 1/2 x 21 1/2 inches. Sheet size: 21 1/2 x 27 inches. Condition: there is age-toning to the paper, and a mat stain in the margin. Laid down (mounted) many years ago onto a paperboard backing, although the glue seems to have been applied only along the edges of the sheet, not in the area of the image.